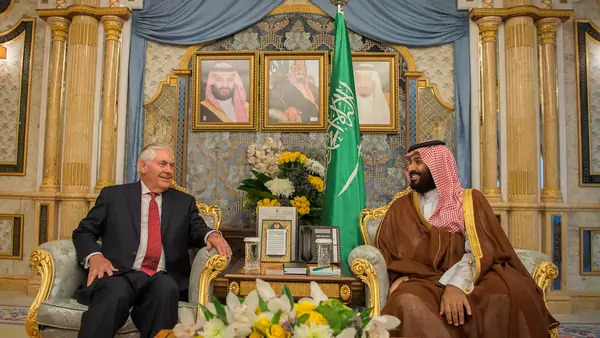 Saudi Crown Prince Mohammed bin Salman meets with U.S. Secretary of State Rex Tillerson in Jeddah, Saudi Arabia (Bandar Algaloud/Courtesy of Saudi Royal Court/Handout via Reuters). This article was originally published here on Salon's website on Sunday, July 16, 2017. A similar struggle is underway today, but it has nothing to do with Israel and its neighbors. Rather it pits Qatar against a coalition comprised of Saudi Arabia, the United Arab Emirates, Bahrain, Egypt and a number of other countries. As the effort to isolate the Qataris enters its seventh week, the Beltway lobbying has kicked into high gear. Various Saudi, Emirati and Qatari officials have made their way to Washington recently to convince American officials of the righteousness of their cause. The Qataris, who have been outclassed diplomatically for the better part of the last decade, have been particularly active playing catch-up, but almost every country involved has joined the fray. This “messaging,” for lack of a better term, comes in a variety of forms. There is the innocuous coffee with senior officials at the Four Seasons, the Mandarin Oriental, the Ritz or the Willard hotels in between meetings at the White House, the State Department and the Pentagon. There is, of course, a lot of spinning going on, but these encounters can also be informative if participants can push whatever minister beyond their prepared answers. Then there are the decidedly uncool offers to fly “thought leaders” to a given country so they can “gain a better understanding of … the situation.” One consultancy went so far as to offer to organize a meeting on the conflict and help find someone to pay for the event. This, to quote the dominant language of the region, is strictly haram, though it is reasonable to believe that some people have taken up the offer. It is good to be a representative, lobbyist and facilitator for countries in the Gulf. The Saudis, Emiratis and Qataris spend tens of millions of dollars a year on firms that provide these services. For these governments (and all the other governments that spend lavishly on representation in Washington) it is money well spent, but when it comes to framing the debate over issues like the Qatar crisis, the return on investment is not at all clear. A recent caricature of Washington’s ideas industry is of the fatally compromised research organization willing to do the bidding of corporate and foreign government patrons. No doubt there are groups and individuals whose questionable judgment has made the image of “DC hacks” a reality. But in the current clash among the Gulf states, there is more nuance to the debate than some might expect given the cartoonish accusation that one group or another “is in the pay of” one side or the other in the Gulf dispute. Take the case of the Foundation for Defense of Democracies (FDD), which has distinguished itself in Washington — whether one agrees with it or not — as a creative source of hawkish foreign policy ideas. In May, FDD convened a conference under the awkward title of “Qatar and the Muslim Brotherhood’s Global Affiliates: New U.S. Administration Considers New Policies” that was critical of Qataris for their alleged role in fostering and financing extremism. Qatar’s supporters point to that conference as Exhibit A in a broad smear campaign that the Saudis, Emiratis and Egyptians have orchestrated inside the Beltway. The very fact that hacked emails surfaced between the Emirati ambassador to Washington, Yousef Al Otaiba, and FDD’s John Hannah (full disclosure: I have broken bread with both on numerous occasions) in which they discuss the event has been reported as the smoking gun. It certainly seems like collusion, but it is not that straightforward. The organization, which does not take any money from the UAE, has long had an interest in the Qatari connection to the Muslim Brotherhood, Hamas and other groups. FDD’s staff has previously done thorough and interesting work tracking terrorist financing that includes Qatar. If critics want to question the substance of FDD’s research and analysis, that is a legitimate part of the production of knowledge. It is quite another to charge that that the organization’s work is done expressly at the behest of the UAE. There is no doubt that FDD’s conference on Qatar was going to happen regardless of what Otaiba and his government wanted. Of course the Emiratis and the Saudis have sought to frame the terms of the debate over the Qatar crisis, but they have not been as successful as one might think given their vast resources. Again, FDD is a perfect example. If it was in the thrall of the anti-Qatar coalition then the organization’s Gulf expert, David A. Weinberg, would not have bestowed upon this world a truly epic tweetstorm eviscerating an error-laden fact sheet that one of Saudi Arabia’s lobbyists blasted to everyone in Washington. The folks at FDD can speak for themselves, of course, but the organization’s minor role in the other Gulf conflict is instructive. First, trying to influence opinion in Washington is, in part, what people like Otaiba, recently arrived Saudi envoy Khaled bin Salman and every other diplomat accredited to Washington is supposed to do. Encounters with foreign officials can be interesting, but for any serious analyst they are never decisive in shaping their worldview. Second, the Saudis, Emiratis, Egyptians and Bahrainis have overplayed their hands in the Gulf and Washington. For all their efforts, Qatar’s leaders have not caved under pressure, and opinion within the Beltway is not necessarily in their favor (FDD’s conference notwithstanding) or supportive of the Qataris. The prevailing view is that there are no perfect allies, all these countries should get their acts together in a variety of different areas, the conflict is counterproductive for U.S. interests, and the sooner it is resolved, the better. There is nothing that a coffee with a foreign minister, a fact sheet or an email from an influential ambassador can do to alter this view. So whatever money the Gulf countries are spending in Washington, they should know it is not very well spent.